Mount Sinai’s Grateful Hearts program is marking its second year and has raised significant funds for the Hospital, all in the name of saying thanks. The Grateful Hearts program at Mount Sinai Hospital is a meaningful way to say thank you. The fundraising and staff recognition program ― set to mark its two-year anniversary on February 14 ― provides an opportunity for patients to pay tribute to someone at the Hospital who made a significant difference in their care ― someone who went well beyond what was expected. 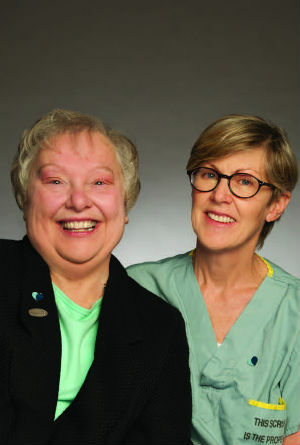 It is a special program for many reasons: because it was started by a very grateful and generous Mount Sinai patient ― Charlene Girt; and because since its inception the program has spread warm feelings of gratitude and appreciation throughout the Hospital, both from patients wanting to say thank you, and from the caregivers or staff members who receive the honour. And that she was. Charlene honoured Dr. McLeod with the first-ever Grateful Hearts donation. Like all Grateful Hearts recipients, Dr. McLeod received a lovely two-toned blue heart pin and a heartfelt thank-you note. Charlene’s enthusiasm caught on like wildfire and, two years later, the program has raised over $140,000 with over 330 patients – some even from as far as Australia - using the opportunity to say a special thank you. This Valentine’s Day we will be celebrating the anniversary of this wonderful program, and honouring all those who ― through love and tender care ― have helped it grow into all that it is today. "I can't imagine going through such a difficult time anywhere other than Mount Sinai. The care they provided for Blake was extraordinary - they literally saved his life over and over. They are true heroes, and we will be saying thank you to them for the rest of our lives." - Michelle Goldman, mother of twins Avery and Blake. Avery sadly passed away at birth and Blake spent six months in Mount Sinai's Neonatal Intensive Care Unit. "Thank you for the care you showed to our mother while she was at the Temmy Latner Centre for Palliative Care at Mount Sinai. Two years later, we still remember your kindness and the valuable work you perform each day." – Alan W.